Friday marked the third anniversary of Sound a Doggy Makes, and today we get to mark an even nerdier achievement! Today is post number 1138! George Lucas, "Uncle George," recently announced film retiree and legend, birther of Star Wars, wrote and directed his original Sci-Fi opus THX-1138. Since then, he's been slipping the number into other works throughout the years. 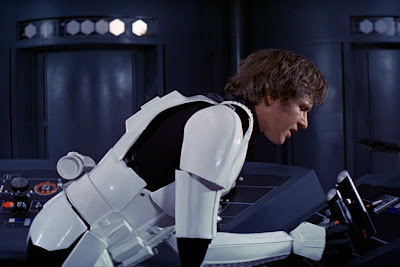 The greatest example of this being the Death Star prison escape scene, in which Luke claims Chewbacca is a "Prisoner transfer from cell block 1-1-3-8," leading to a massive firefight, and Han getting to utter the wonderfully pathetic stalling measure atop this very page. Miraculously, I frequently look at clocks at exactly 11:38. And just today I examined a tax document I received last week and discovered my taxable earnings at an old job totaled precisely $1138.50. This is how I know I'm doing what I'm supposed to be doing. Recurring nerdistry only I would appreciate. Me, Steve Sansweet, and 300,000,000 internet nerds.